In many cases, I like oil. Face oil, hair oil, oil cleansers–all good. But oily T-zone? No thanks. Especially in my heavily photographed and filmed line of work, I can’t have clients walking around all shiny-faced. A good mattifying product is key, and girl, do I have a good one for you. It’s MAC Oil Control Lotion, and it’s worth every penny. If you have oily skin, you can use this as a primer or wear it alone if you’re going foundation-less. It’s a thin (but not gross and watery) white lotion. It’s got a pleasant scent that I can’t identify, but it doesn’t linger. It absorbs quickly and doesn’t make skin feel sticky or tight. A little dab will do ya–one pump is plenty–so you won’t go through it super fast. This magical product really does absorb oil though, so I don’t recommend it if you don’t have truly oily skin or an always-shiny T-zone/other area. I have combination skin with an always-oily T-zone in warmer temps, but I don’t use this in the colder months when my skin tends to be more on the dry side. Using this product on a dry skin type can cause any makeup you apply over it to be harder to blend, as it causes the minimal oils that are present on dry skin to be absorbed, causing face makeup to stubbornly stick to the dry areas. 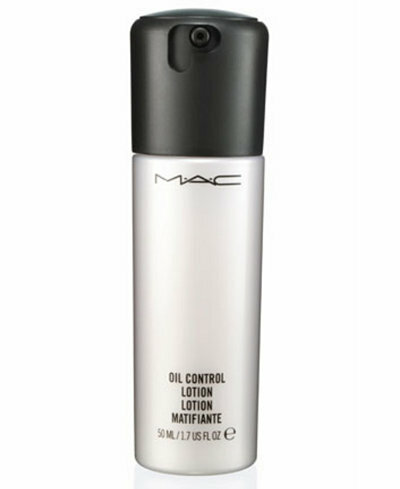 MAC Oil Control Lotion is an essential in my pro kit and in my personal makeup bag. It’s one of the most effective products out there. If they ever discontinue this, there will be a lot of shiny, (un)happy people walking around. If you or someone you love is fighting the shine, this is the ultimate weapon. It’s got my full makeup artist and licensed esthetician stamp of approval.